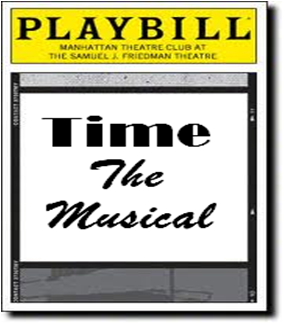 Time – The Musical is an original A Frank Angle production featuring songs about time. Time is vast in many ways. It can be complex or straight forward. It can be a chronological point or a special moment – cyros or kronos . A point determined by the sun’s continuous movement, or that some moment of the heart and mind that is timeless. One doesn’t have to be a Christian to appreciate the beginning of chapter 3 from the Book of Ecclesiastes (commonly referred to as A Time for Everything). It’s appropriate for all. I first posted about time here, and then later as a joint effort with a photographer – and in time, came the joy known as Time: The Musical. For me, this musical extravaganza ends to beautiful music fitting for a prologue. The video is actually a commercial that I adore, which (to me) seems to be about chronos through karos. The challenge for the audience is to share a musical treat about a personal special moment in time or a song about time that you enjoy. Try not to embedding, but I don’t mind unembedding. Thanks to everyone who participated in this musical, and I will announce the next musical in a future Opinion in the Shorts. It has come to my attention that past acts have crashed browsers. Please 1) include the song title and artist in your text, and 2) paste the URL as part of your last line (not a new line). The latter will provide a link, thus not embed the actual video … but I don’t mind unembedding, so apologies are not necessary. Ladies and gentlemen, to kickoff Act 12, I return to my college days. This was the favorite song two of my friends who eventually married. Dedicated to Steve and Cindy because it was their song, so an AFA welcome to The Strawbs with Autumn. Act 11 is about Future Time, so song titles must include either Future or a definite reference to the future. Note: Tonight is not acceptable. Ladies and gentlemen, to kickoff Act 11 is a Canadian legend singing The Future. A grand AFA welcome to Leonard Cohen! Act 10 is about compound time featuring song titles that include compound words in which one is time – such as nighttime, bedtime, springtime, etc. PS: I have schedule Act 11 for next week, but the conclusion will be in January. Ladies and gentlemen, two legends collaborate to kickoff Act 10. A grand AFA welcome to Louis Armstrong and Ella Fitzgerald with Summertime. Act 9 focuses on songs about extended time … long time. Examples of words in the title include decade(s), century(s), era, epoch(s), and potentially others. “Years” can be used if and only if the number is at least 100. Future dates as 2525 are not acceptable. Besides pleasing the producer, an additional challenge for attendees is no duplicates. Ladies and gentlemen, to kickoff Act 9, a grand AFA welcome to Sting with A Thousand Years. Act 8 focuses on songs about short time. Because songs with minute(s) and second(s) are limited, the producer is opening it up to other words as moment, ticks, instant, and others – but beware as words have other meanings outside of the sense of time. Besides pleasing the new producer, an additional challenge for attendees is no duplicates. It has come to my attention that past acts have crashed browsers. Please 1) include the song title and artist in your text, and 2) paste the URL as part of your last line. The latter will provide a link, thus not embed the actual video. But I don’t mind unembedding. .
Ladies and gentlemen, to kickoff Act 8 is one of my favorites named after a continent I haven’t visited. A grand AFA welcome to Asia with Heat of the Moment. Act 7 only features songs with hour(s) in the song title; but the challenge for attendees is no duplicates. It has come to my attention that past acts have crashed browsers. Please 1) include the song title and artist in your text, and 2) paste the URL as part of your last line. The latter will provide a link, thus not embed the actual video. But I don’t mind unembedding. Ladies and gentlemen, to kickoff Act 7, a grand AFA welcome to a classic musician and member of the Rock and Roll Hall of Fame playing the Midnight Hour Blues – let’s hear it for Eric Clapton.